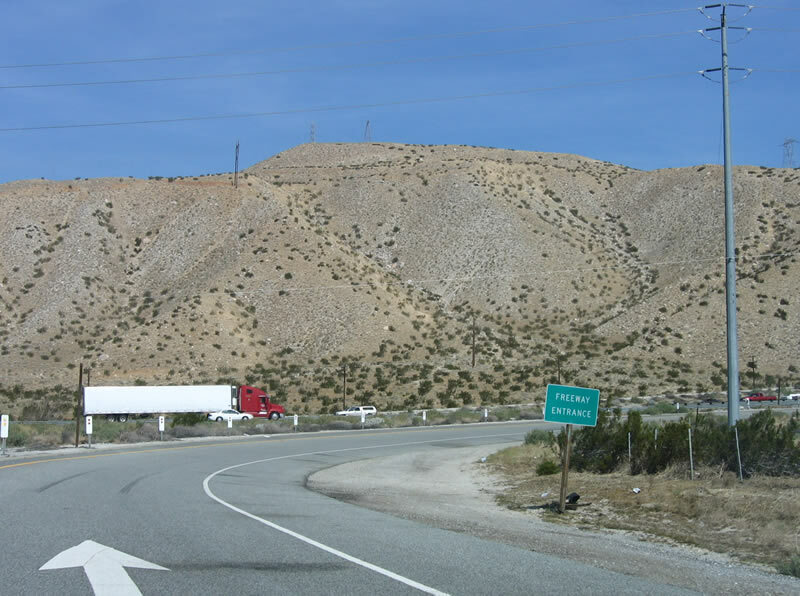 Until 1964, U.S. 70 was signed along the current Interstate 10 corridor, connecting downtown Los Angeles with San Bernardino and the desert cities of Palm Springs, Indio, and Blythe. 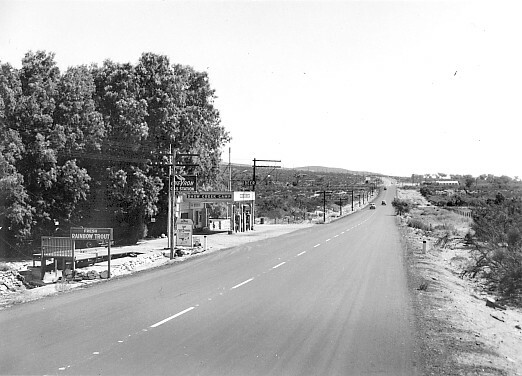 The freeway was built in stages through the 1960s, but signage for U.S. 70 was gone in 1964. 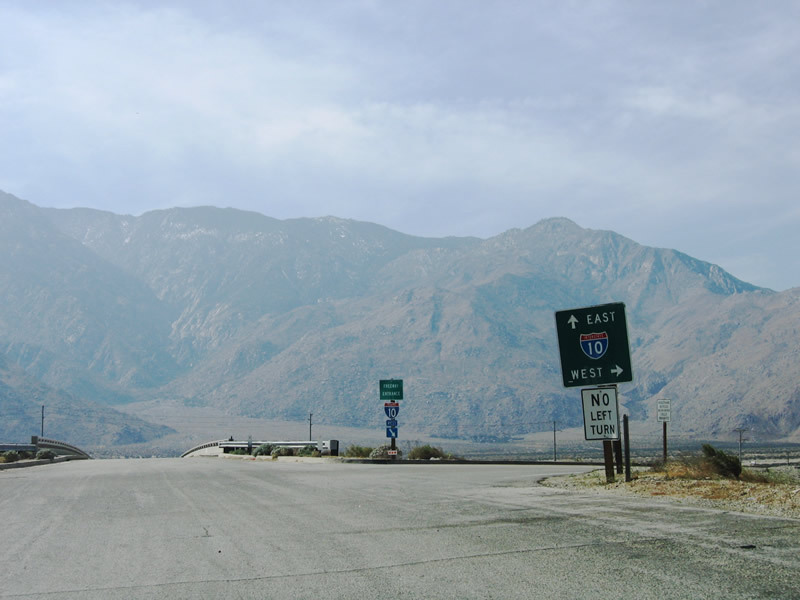 Incomplete sections were signed as U.S. 60 until 1972. 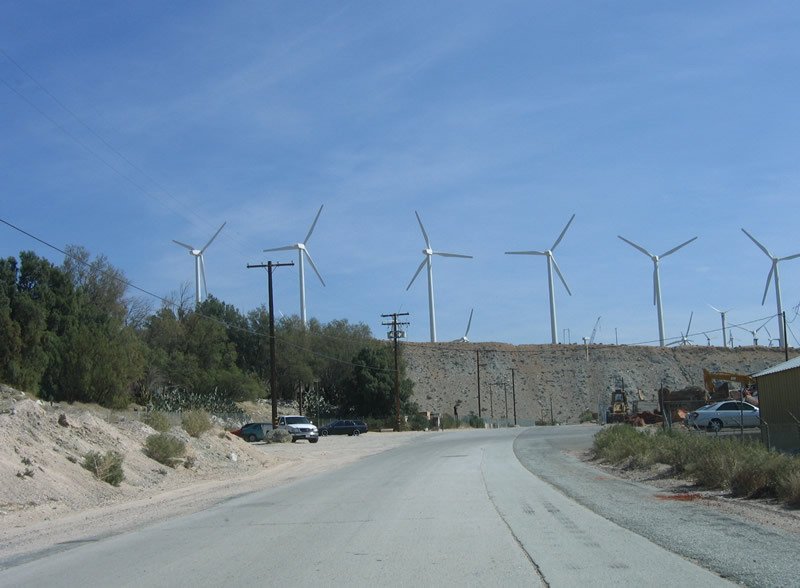 The route was cosigned with U.S. 60 from Beaumont east to the Arizona state line near Blythe and with U.S. 99 from Beaumont east to Indio. 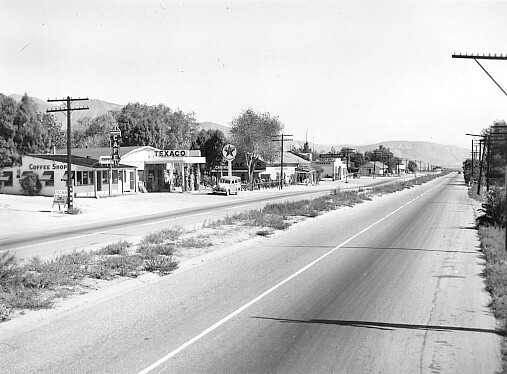 U.S. 70 did not emerge as an stand alone U.S. highway until Globe, Arizona; with the overlapped sections eliminated, Globe now serves as the current western terminus of U.S. 70. 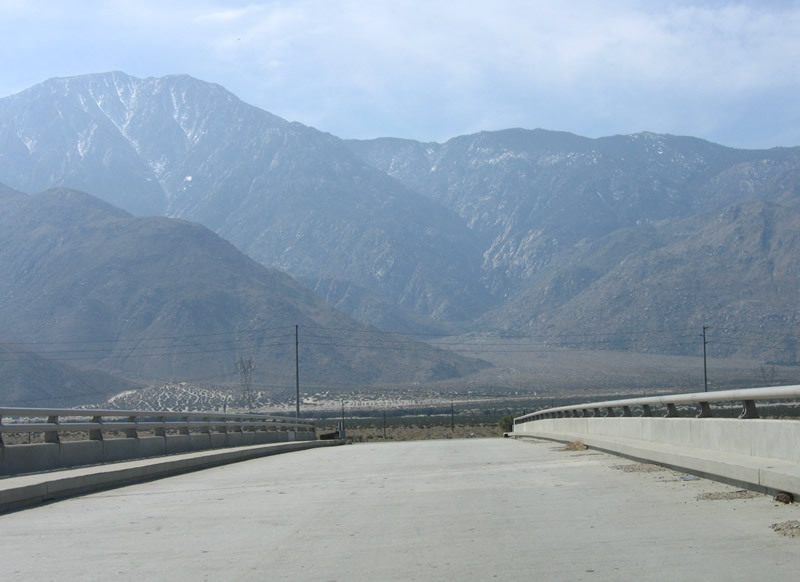 A narrow concrete bridge carries Whitewater Cutoff Road over Interstate 10 at Exit 114. An old bridge crosses the Whitewater River around the bend ahead. Photo taken 02/25/06. 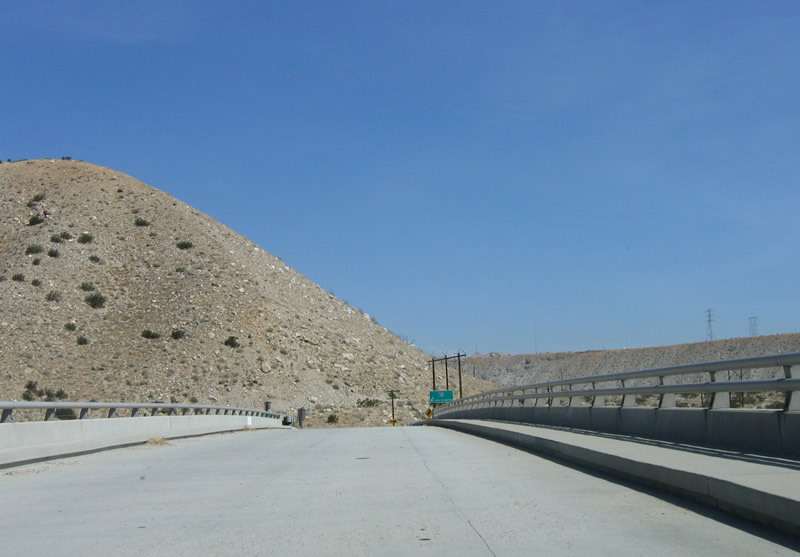 This ramp connects to Interstate 10 west toward San Bernardino and Los Angeles. Photo taken 02/25/06. 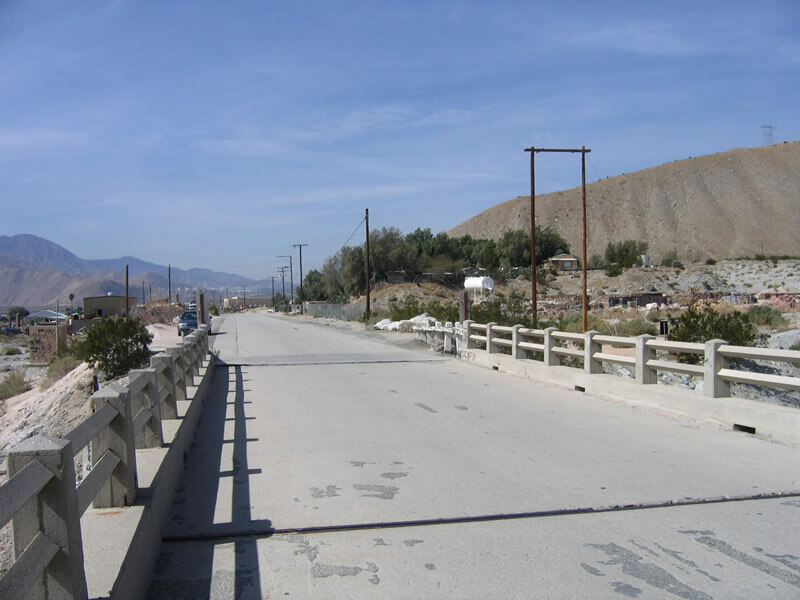 Now passing through the town of Whitewater, Old U.S. 60-70-99 features twin-slab concrete as the old road approaches the Whitewater River bridge. Photo taken 02/25/06. 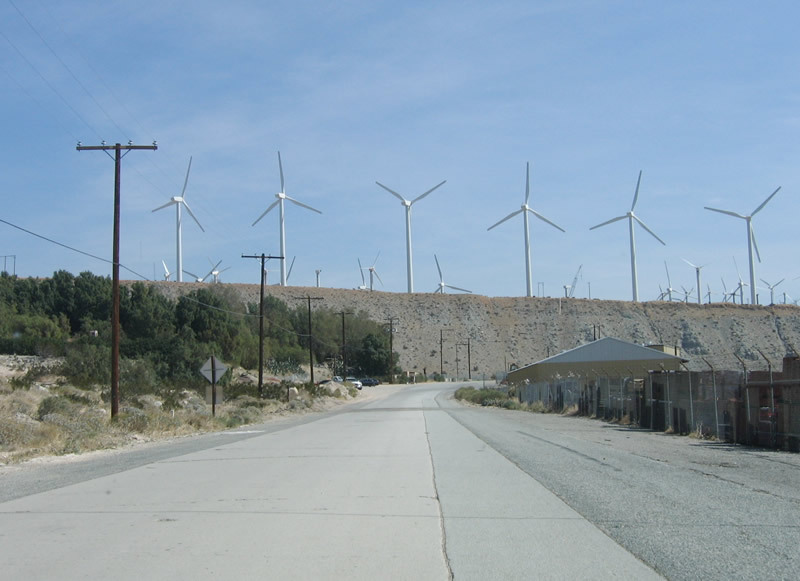 Wind turbines from the San Gorgonio Pass wind farm dominate the view as eastbound U.S. 60-70-99 pass through the small settlement of Whitewater. Photo taken 02/25/06. U.S. 60-70-99 used to cross this bridge over the Whitewater River. 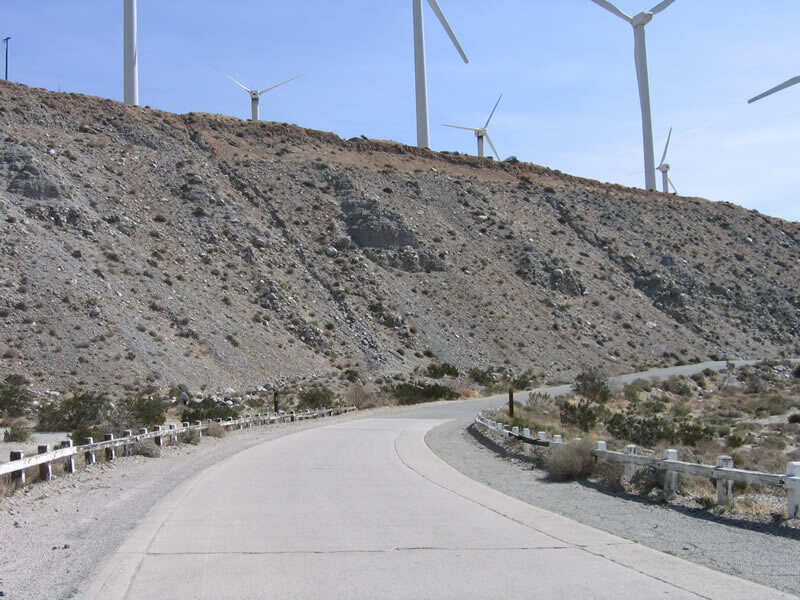 The Whitewater River drains from Mount San Gorgonio, and during the winter and spring months, water flows through from the high country down toward Palm Springs, the Coachella Valley, and the Salton Sea. Much of the old road standards still remain here, including the banked roadway and approach onto the bridge. Photo taken 02/25/06. The bridge railings and supports are all made of concrete, just like the bridge deck. This bridge was built in 1925, just before it was signed as U.S. 99 in 1926. 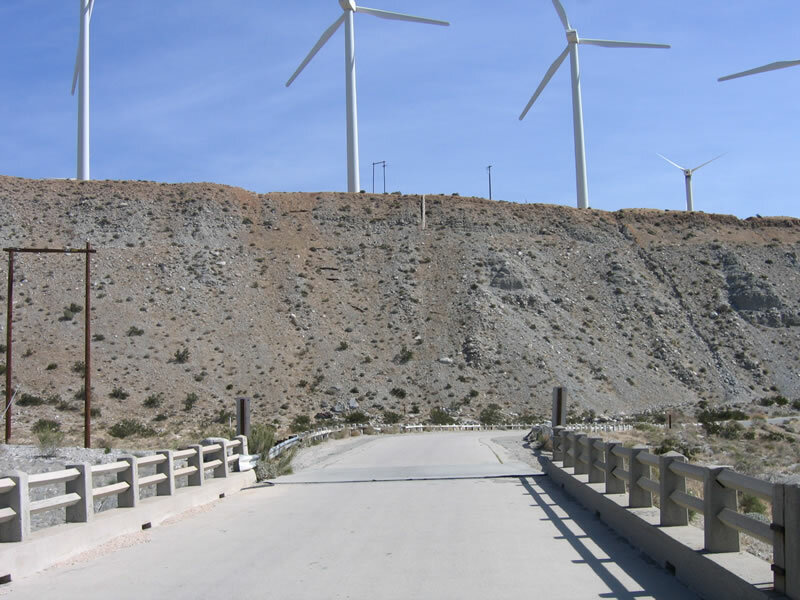 According to Casey Cooper&apos;s Finding U.S. 99, "The piers [of the bridge] actually are set 20 feet below ground and are anchored to bedrock below the riverbed." 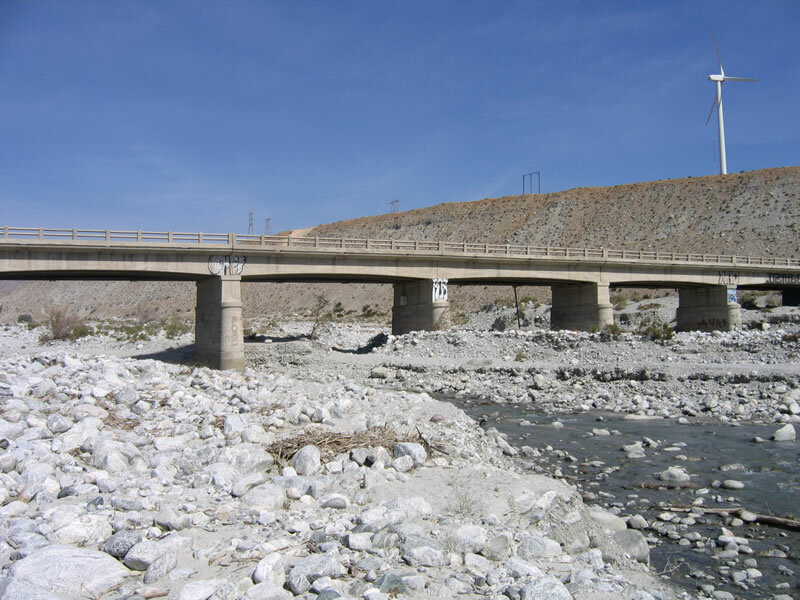 This monumental bridge has withstood many floods since it was built so well. Photo taken 02/25/06. With only two lanes in width, the Whitewater River bridge is fairly narrow and would not be sufficient to meet today&apos;s larger vehicles. A replacement pair of bridges were built in 1952 (opened in 1953) as part of the new U.S. 60-70-99 expressway. 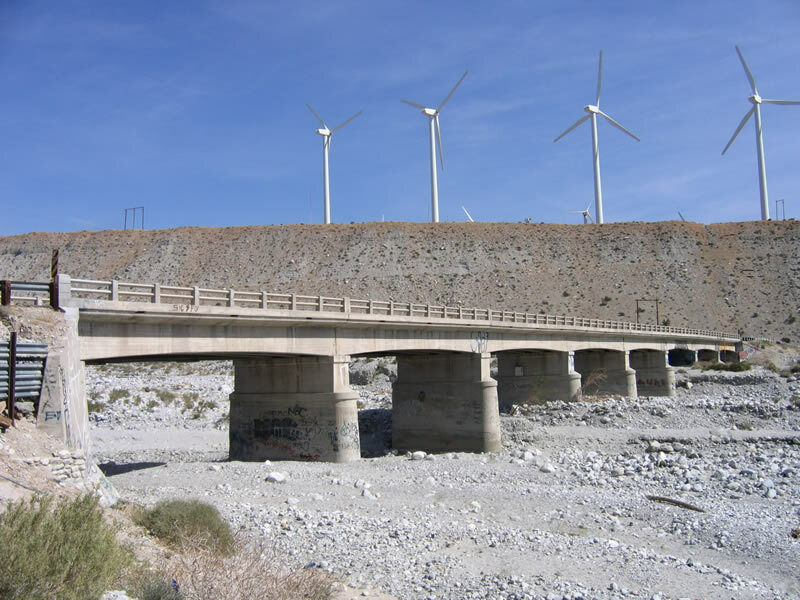 These bridges are is now part of the Interstate 10 bridges that span the river. (The bridges were widened to eight lanes in 1967.) Photo taken 02/25/06. 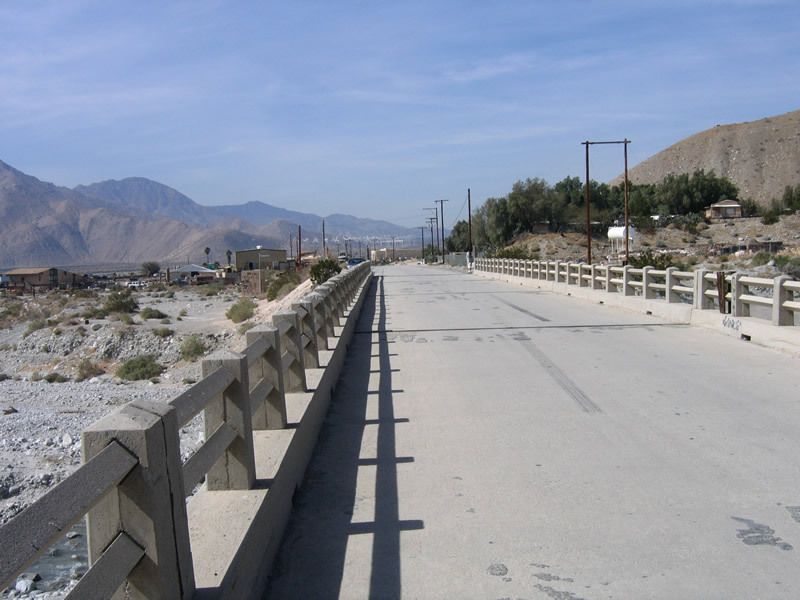 At the east end of the bridge, the old U.S. 60-70-99 roadway banked to the south, with white wooden fencing still in place to act as guardrail. Photo taken 02/25/06. 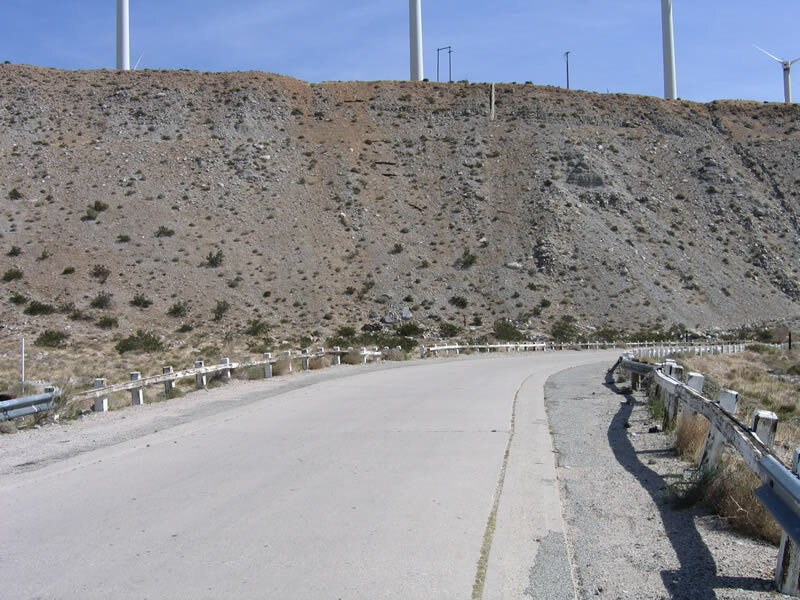 The shoulder of this old road was widened a bit with concrete and again with asphalt. At one time, this road was striped. Photo taken 02/25/06. After making the banked turn to the south, the old road reverts from concrete to asphalt. Photo taken 02/25/06. 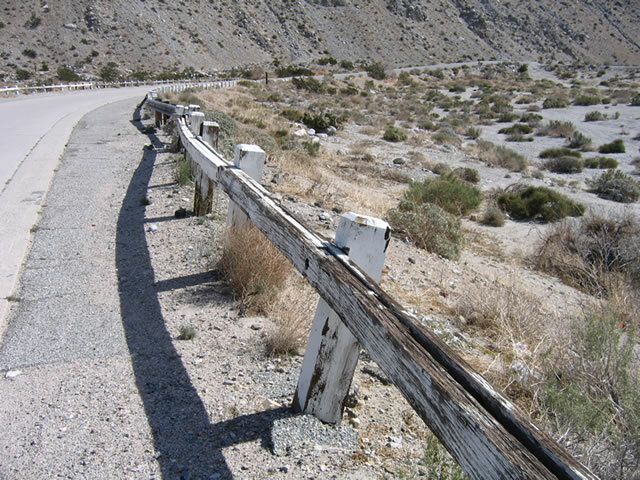 The fence guardrail has certainly seen some better days, especially considering the baking sun in the desert. However, it is still used today, and it is in fairly decent condition considering the age of the road and bridge. Photo taken 02/25/06. Now looking westbound, U.S. 60-70-99 prepare to cross over the Whitewater River, which was built in 1925. 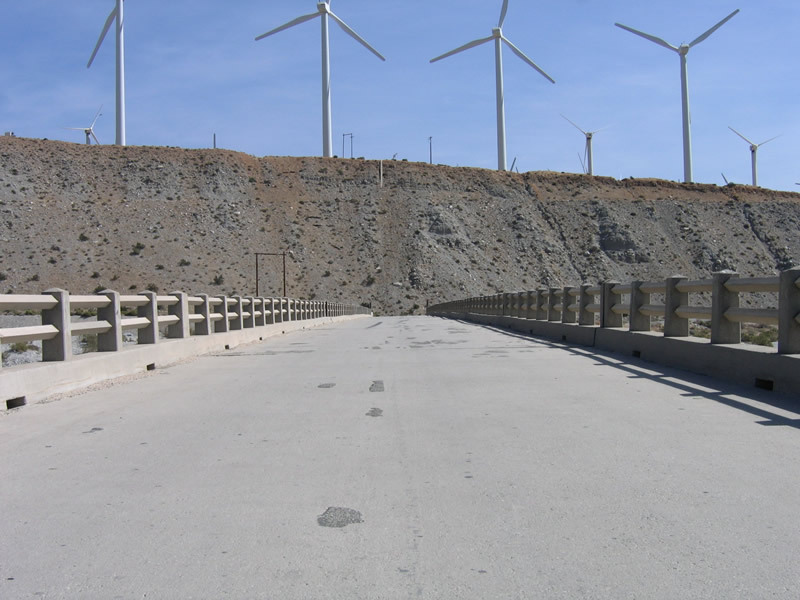 The concrete road leading to the bridge was also built during this time frame. Photo taken 02/25/06. The bridge railings and supports are all made of concrete, just like the bridge deck. Photo taken 02/25/06. For a bridge that is 80 years old, it is in remarkably good condition. Photo taken 02/25/06. A few expansion joints such as this one separate out the sections of the bridge as U.S. 60-70-99 cross over the Whitewater Bridge. Photo taken 02/25/06. On the other side of the Whitewater River bridge, U.S. 60-70-99 continues west toward the settlement of Whitewater. Photo taken 02/25/06. 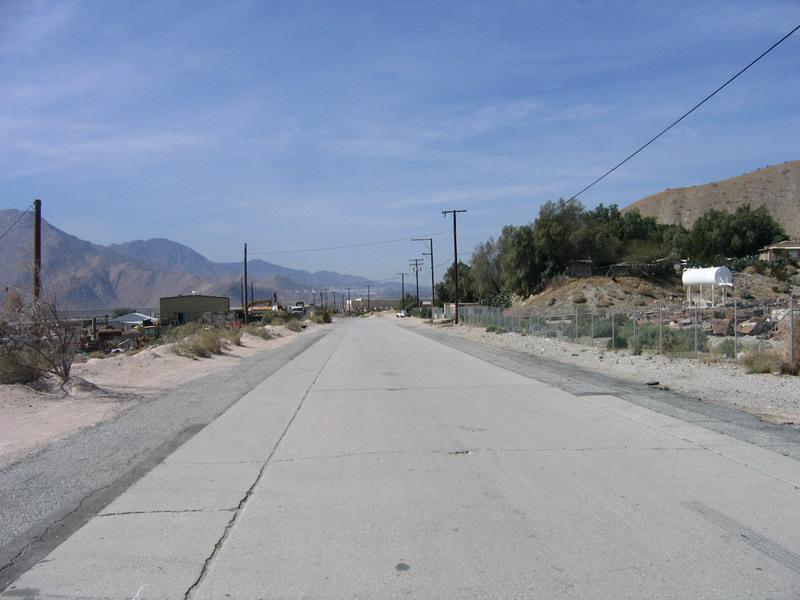 This section of old road retains its concrete, which is uncommon for much of old U.S. 60-70-99 in the desert. Photo taken 02/25/06. 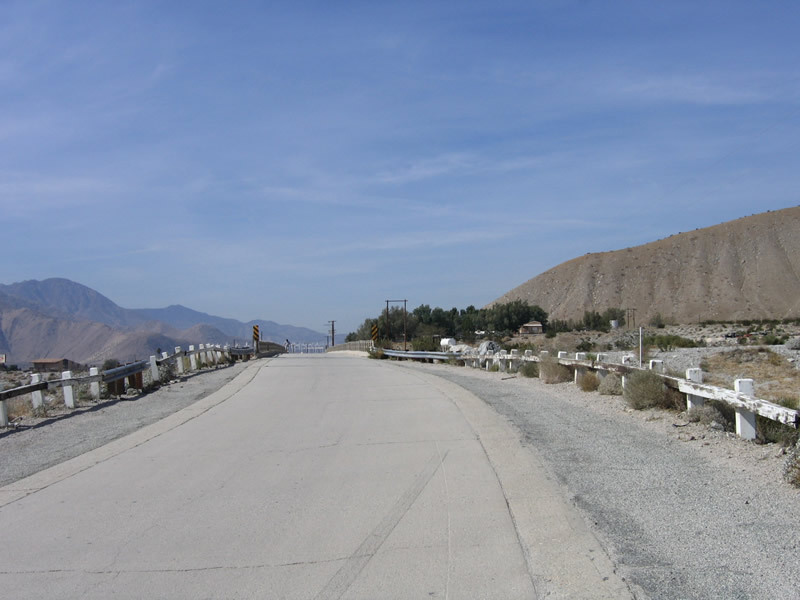 Originally, the concrete road continued straight ahead over the freeway. 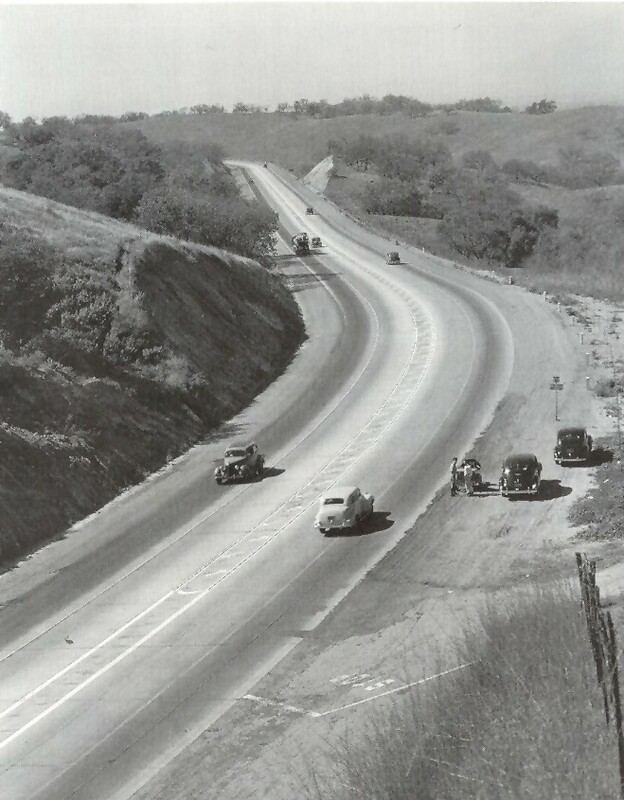 It was realigned in the early 1950s when the new U.S. 60-70-99 expressway was built. Photo taken 02/25/06. 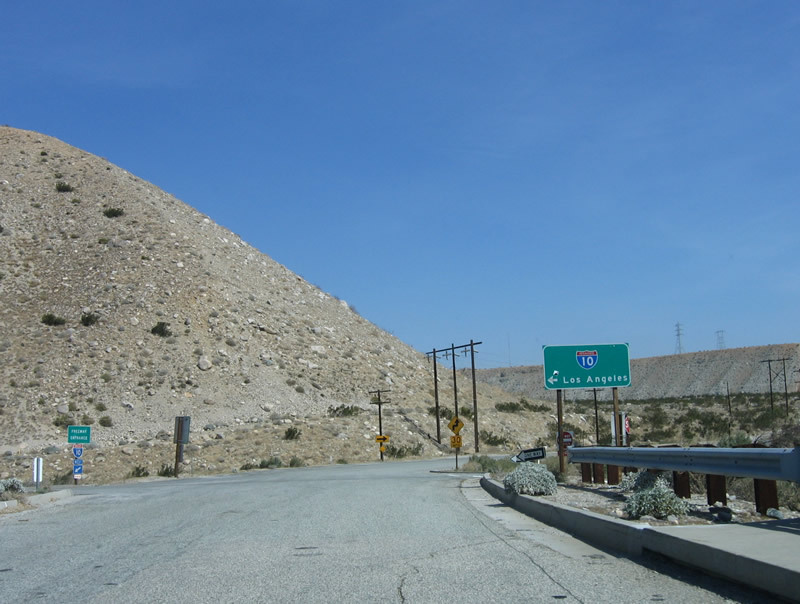 Returning to Interstate 10, the first ramp connects to westbound en route to Los Angeles. Photo taken 02/25/06. 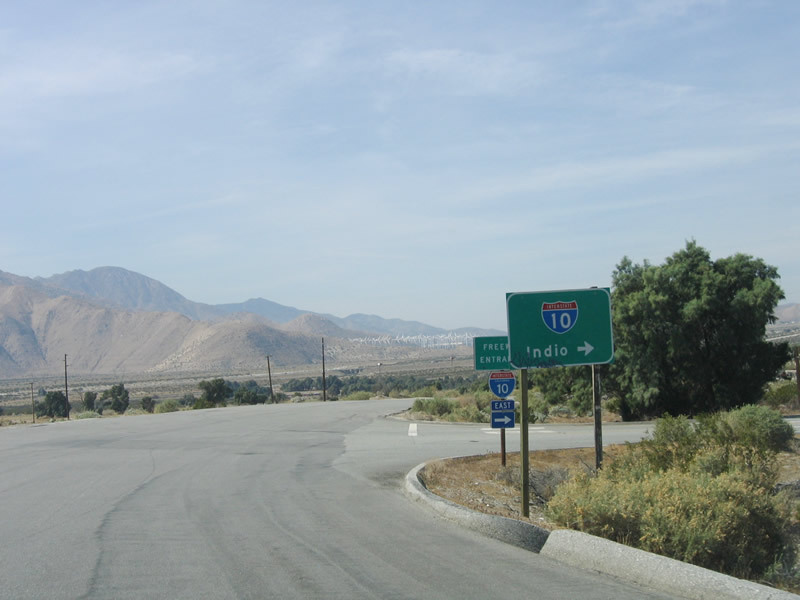 After crossing over Interstate 10, the next ramp connects to eastbound Interstate 10 en route to Indio, Blythe, and Phoenix, Arizona. Photo taken 02/25/06. Whitewater Cutoff Road transitions directly onto Tipton Road, which carries former U.S. 60-70-99 along the south side of Interstate 10. 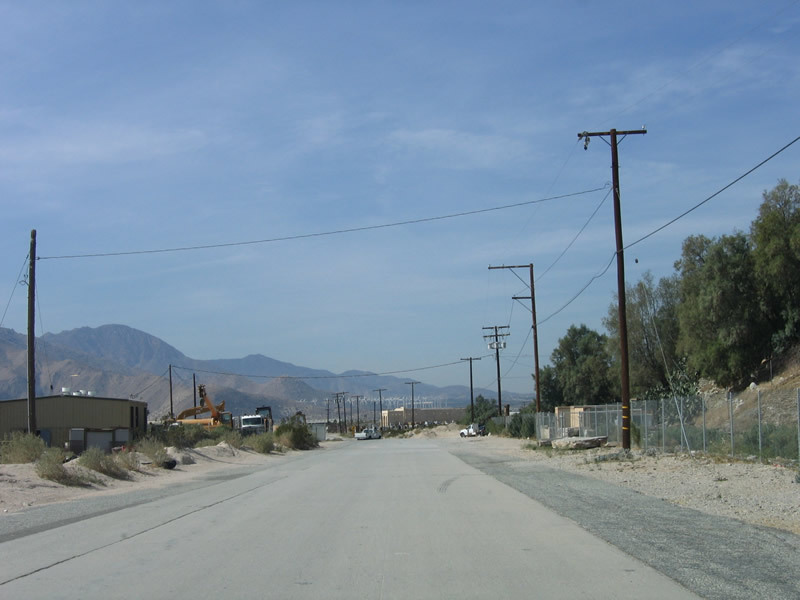 Tipton Road connects with California 111 (Palm Canyon Drive) southwest of here. Photo taken 02/25/06. After merging back onto Interstate 10 eastbound, this freeway entrance sign advises of the transition from Whitewater Cutoff Road onto the freeway. Photo taken 02/25/06. 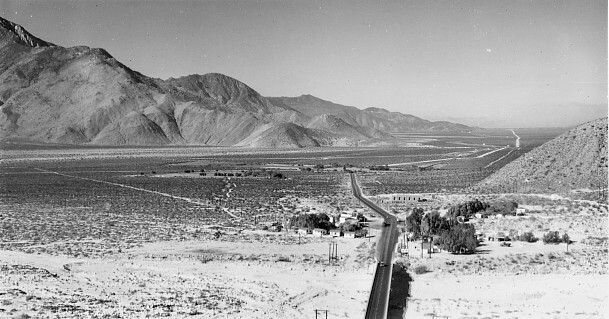 Looking out west over Whitewater with bridge in foreground and highway before 1952 realignment. 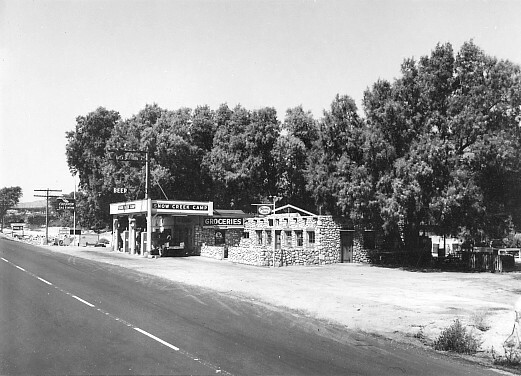 Photo taken By Darin Kuna (1947). Looking at Bridgehaven Cafe in Whitewater, just before the bridge. Photo taken By Darin Kuna (1947). 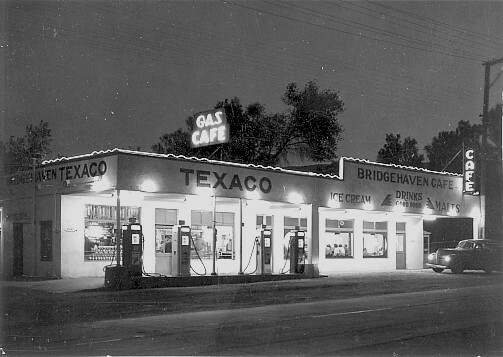 Bridgehaven Cafe at night. Photo taken By Darin Kuna (1947). Looking east at Snow Creek Cafe. Photo taken By Darin Kuna (1947). Looking west at Snow Creek Cafe. Photo taken By Darin Kuna (1947). 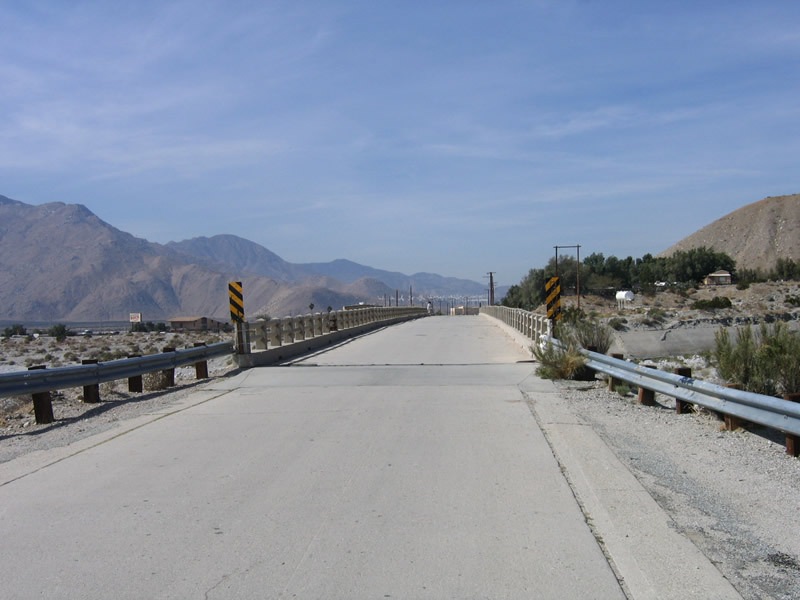 The Whitewater River bridge carries Old U.S. 60-70-99 over the Whitewater River near Whitewater, which is northwest of Palm Springs. 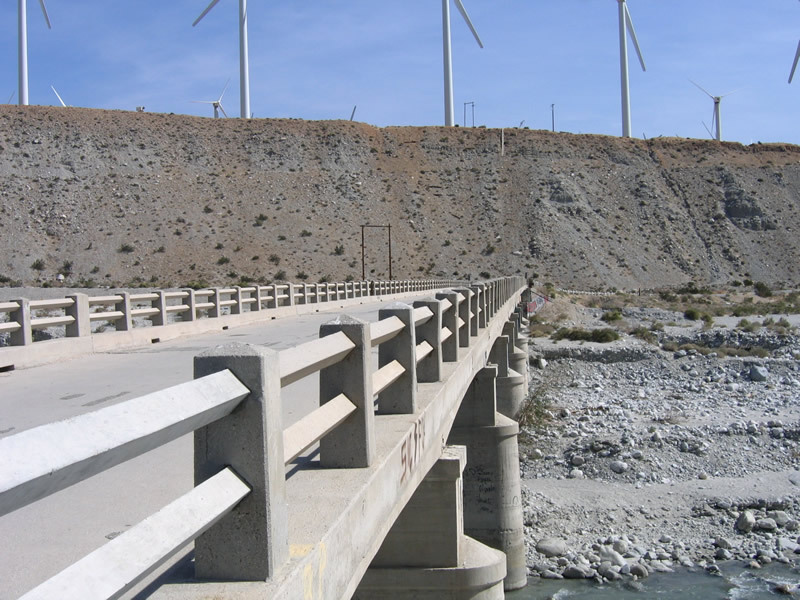 This bridge is visible to motorists driving by on Interstate 10. Photo taken 02/25/06. 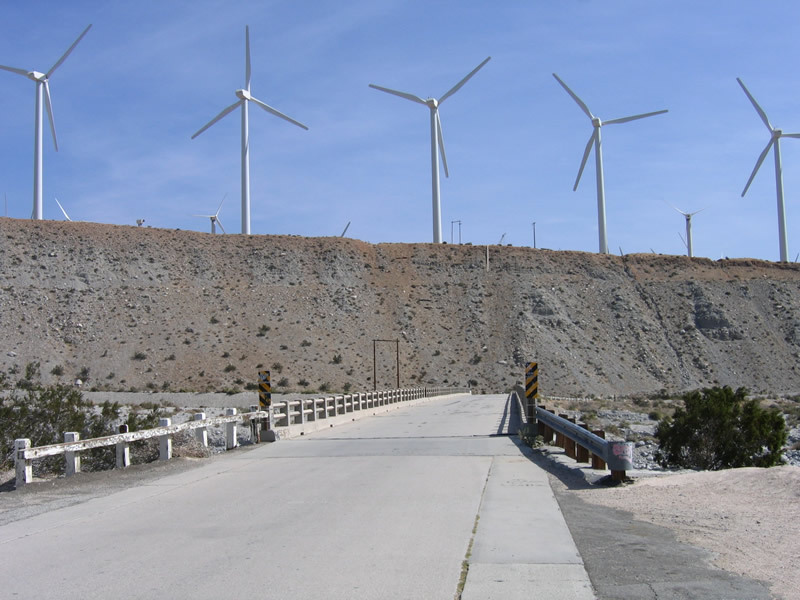 Wind turbines that grace San Gorgonio Pass hover above the Whitewater River bridge. Photo taken 02/25/06. Highway 60-99-70 over Kellogg Hill. Photo taken By Darin Kuna (1940). 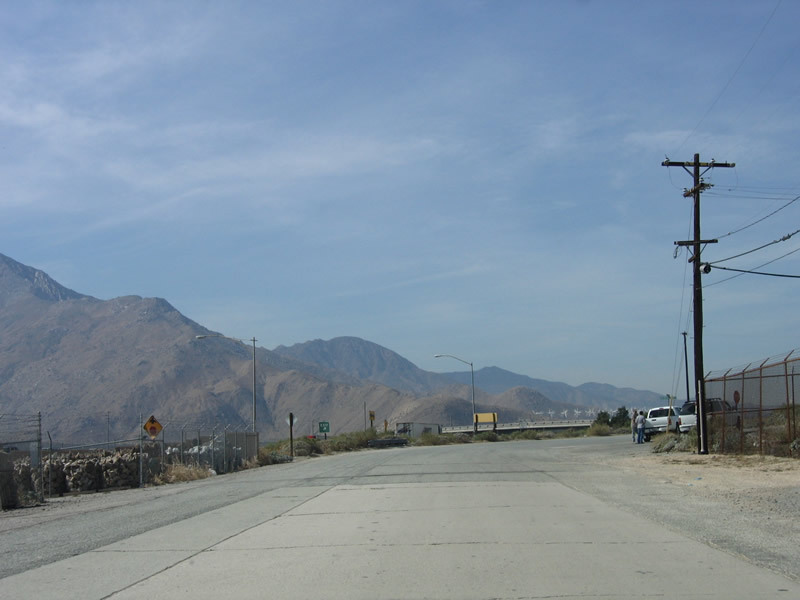 Looking east on U.S. 99-70-60 thru Cabazon. 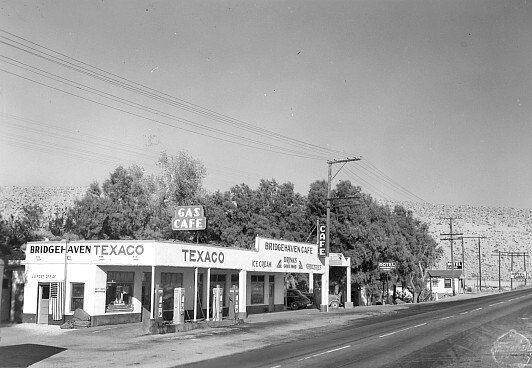 Photo taken By Darin Kuna (1947). Page Updated April 29, 2006.